1. Cut up red peppers and onions, and cauliflower. 2. Put cauliflower in boiling water for 2 minutes, drain and set aside. 3. In a bowl, whisk lime juice, white wine, curry paste, oil and herbs together. 4. Toss shrimp and all vegetables in marinade. 5. Refrigerate for a minimum of 1 hour, up to 12. 6. 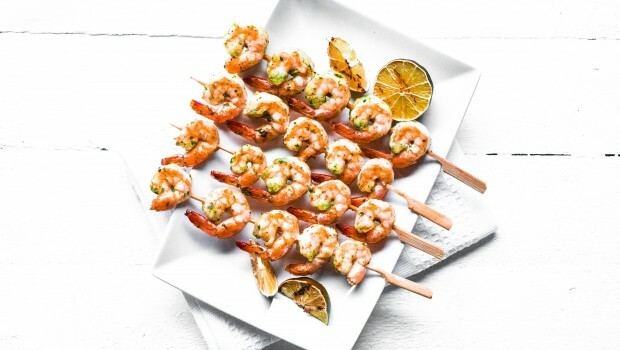 Place shrimp and vegetables on skewers, alternating. 7. Grill on BBQ, medium heat for 15 – 18 minutes, turning once.